Digital transformation is changing every aspect of the business landscape, provided that leaders are ready to embrace it. What’s the state of digital disruption and what should businesses expect? We are already experiencing a period of digital transformation, and the businesses that already acknowledge it enjoy its benefits. But what can we expect from the next few years, and how can businesses keep pace with the changes affecting their industry? Harvard Business Review Analytics Services and Microsoft published the report, “Competing in 2020: winners and losers in the digital economy” to give an overview of the state of digital disruption and how business leaders are reacting to it. These are the most noteworthy points to consider. According to the survey, 80% of the respondents believe that their industry will be disrupted by digital trends. 4% of the respondents believe that their industry reached its point of disruption prior to 2010, with 24% believing that it did so between 2010 and 2016. More than half of the respondents (56%) feel that their industry is reaching a point of disruption within the next three years, while 16% of them see digital disruption approaching in their industry beyond 2020. This indicates that every industry has its own perception of the idea of digital disruption and whether they are ready to embrace it. When it comes to recognizing how their businesses integrate digital technologies, only 16% of respondents considered their business to be “digital”. 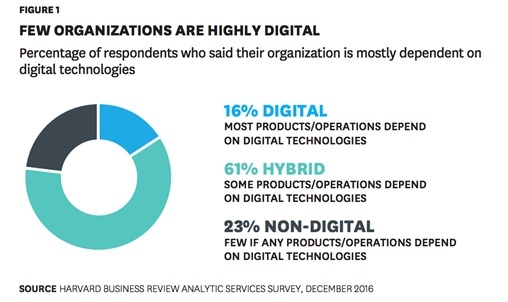 61% of them believe that they are hybrid, with some of their products or operations dependent on digital technologies, and 23% of them feel that they are still non-digital. Thus, there is still a practical gap between understanding the arrival of digital transformation and implementing it among products and services. Both digital and non-digital companies recognize that digital disruption is coming, but not all of them are still participating in it. 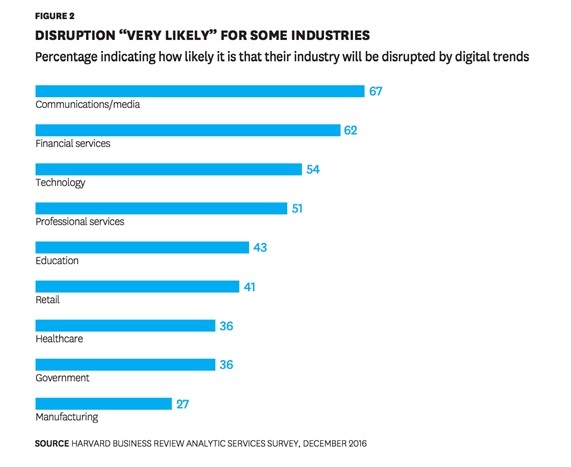 Some industries seem to be more receptive than others to the prospect of transformation, with communications/media companies, financial services and technology companies being the first to recognize that they are “very likely” to be affected by digital transformation. On the other side, manufacturing, government and healthcare industries don’t seem to recognize digital disruption to the same extent. This could be explained by a lack of understanding on what digital transformation may mean for their industries, or it may simply be due to an inability to apply practical digital trends in their businesses. 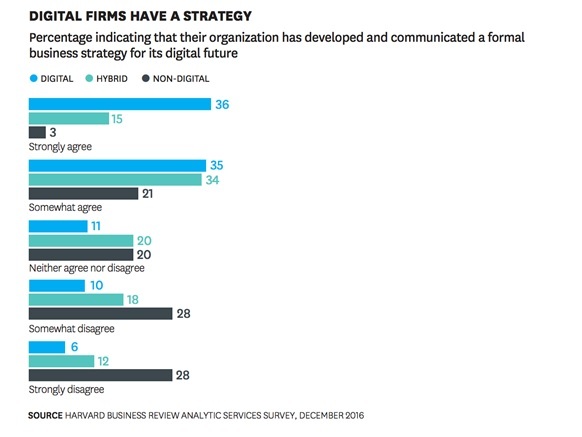 There is a great variation in respondents’ answers on whether they have a formal business strategy for the forthcoming digital future. 47% say that they have already developed a formal business strategy, which means that the remaining 53% are still not prepared for the disruption that will affect their organizations. This percentage also varies depending on the industry and the state of digital transformation they’re currently in. For example, 72% of digital leaders have a formal business strategy, versus 49% of hybrids and 24% of non-digitals. Technological companies and financial services businesses seem to be more prepared with formal strategies, while government, healthcare and retail are unsurprisingly lagging behind. When it comes to the person who leads digital transformation in an organization, CEOs seem to be the first ones to embrace the change. The percentage is even larger in digital organizations, with 43% of them considering their CEO to be the one in charge of digital strategy. 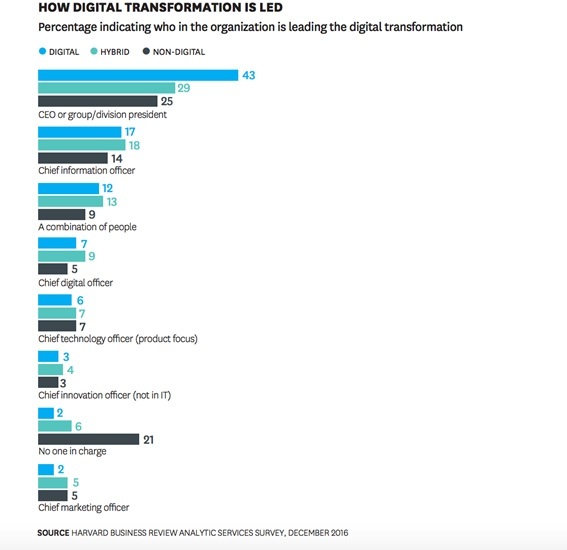 The CIO is the second person who is likely to lead digital transformation in an organization, while CDOs and CTOs follow up. It’s interesting to note that 21% of non-digital organizations answered that they don’t have a particular person responsible for digital strategy. This means that there is likely to be a lack of coherent leadership regarding digital strategy, which is borne out by their difficulty in keeping up with digital trends. In a very positive sign, 86% of respondents view digital transformation as an opportunity for their industry, rather than as a threat. The main reason organizations are moving to digital is to create an exceptional and highly relevant customer experience, with 40% of respondents considering it their main priority. Customer experience has already been improved with digital integration, from online purchases to customization and instant communication. We can expect further innovations in this area in the near future with the integration of AR and VR. The firms surveyed largely agreed on the main benefits of the digital shift: a closer relationship with customers (72%), greater value chain integration (67%), and increased integration or collaboration with adjacent industries (42%). Once again, customer experience seems to be the primary reasons that organizations are willing to embrace digital change, with technology and collaboration following close behind. Digital transformation does not come without challenges, and there are many barriers to its integration in a business. Respondents of the survey were asked to identify the most significant barriers towards adapting to digital transformation within the coming years; 54% of them named their organisation’s structure as the biggest challenge. A very similar percentage (52%) named resistance to change as a key barrier to digital transformation in their business, while other responses included a lack of digital skills, resources and budget. The resistance to change is probably the most interesting challenge identified, as it indicates that some organizations are not receptive to new trends. This may require further collaboration and training to help them understand the benefits of digital disruption to their services. Moreover, the lack of resources, budget and skills cannot be overlooked, with the latter creating the need for everyone to develop the right traits that make a digital leader. 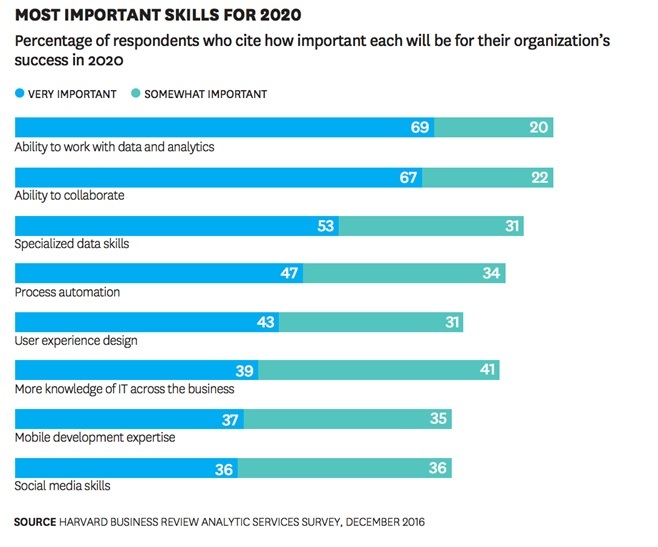 According to respondents, the most important skill that digital leaders need to have for 2020 is the ability to work with data and analytics, with focusing on specialized data skills ranked third in the list. The ability to collaborate was the second most popular skill, with respondents clearly recognizing the need for more people in their organization to develop the right skills to embrace digital transformation. Process automation, UX design, mobile and social knowledge were all identified as skills that will be in higher demand within the coming years, highlighting the variety of traits required to get closer to digital transformation. Digital disruption may already have taken place across many industries, but it’s not too late for more business to embrace it in an attempt to remain relevant and successful. Flexibility, collaboration, and learning new skills are important for digital leaders – but also for everyone trying to understand how digital technologies can help a business grow over the coming years. It’s a positive sign that the majority of respondents see digital transformation as an opportunity for their organization rather than as a threat, but the biggest challenge remains helping them to recognize its actual place in a business. Once this is achieved, non-digital organizations and hybrids can learn from digital leaders about the benefits of having a formal digital strategy and how this can be implemented in their business.